The Rwenzori Mountains National Park is a mountain range with steep slopes, that ranges from 1,670m to 5,109m in altitude. Its highest peaks have permanent snow fields and glaciers. It constitutes also a vital water catchment area, sheltering the highest and most permanent sources of the River Nile. Due to high and regular rainfall, the area is home to luxuriant and unusual flora. The Rwenzori are located on the border between Uganda and the DRC. The Congolese side of the mountains are covered by the Virunga National Park WHS. 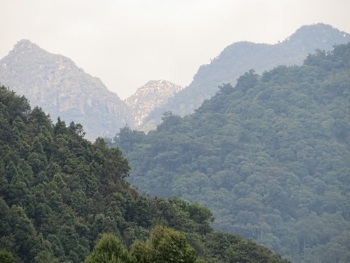 Rwenzori Mountains National Park covers a 80km long mountain ridge in the far west of Uganda. It forms a natural border with the DR of Congo. The park attracts some 2,700 visitors a year, of which at least half are local schoolchildren. The others are mainly trekkers and mountaineers, arriving to hike a 10-day circuit or give the 3rd highest peak of Africa (Margherita’s Peak) a try. WH travellers do not often make it there: so far only 16 claim to have visited it, while noone has written a review yet. In preparation of my visit I had been looking for the best access point to get into the park without having to do a multi-day hike. I found out that there are two main entries: one at Nyakalengija (with the Equator Snow Lodge and Ruboni Community Camp) and one near Kilembe. I choose the latter, as the Rwenzori Trekking Services (RTS) advertised one day treks into the park departing from the associated Trekkers Hostel Kyanjiki. The office of the RTS, whose members accompany the hikes and maintain the trails, is also found on the hostel’s premises. The Nyakalengija trailhead is managed by another company (Rwenzori Mountaineering Services), which gets mixed reviews especially due to their mountaineering safety standards. So I ended up in Kyanjiki near Kilembe, itself already an extraordinary sight: it is an abandoned mining village, with lots of collapsed buildings and a broken-down cable car system. The endless rows of houses for the miners are now rented out to ordinary people, it looks very shabby and poor. Since last year mining (for copper and cobalt) has resumed however in this area, when the Chinese-owned Tibet-Hima Mining Company Limited won the concession. After a good night’s sleep in the basic Trekkers Hostel, I started my one-day trek at 7.30 a.m. Our goal would be the Musege rock-shelter, a post at 2,240m elevation. This is a 9km walk one-way, and you have to come the same route back. I had the pleasant company from three young Chinese (two men and a woman) who work for a Chinese oil company in Kampala. They were visiting the Rwenzori on a weekend trip from the capital. We had two dedicated RTS guides with us. The hike started out quite strenuous, it’s a 2.2 km long route out of the village and over a ridge before you even enter the national park. Fortunately it gets much better after that. On the other side of the hill we walked on paths through farmlands. They mostly grow cassava here. And there are cows and goats. After an hour’s walk we came upon a stone building: the park office. Here we had to pay the 35 US dollar entrance fee and write down our names in the visitors log. I had been deliberating quitting the trek here (the Chinese girl had had the same thoughts, she confided), as I was afraid the hiking would be too tough for me. But I decided to continue as the going had been so easy. And it stayed that way for another hour or 2. Within the park borders, the trail runs parallel to the Nyamwamba River and is almost flat. Monkeys are often seen here, but we didn’t encounter any. One of the guides showed us a chameleon: it was so well camouflaged that it looked like a dead leaf. After about 3.5 hours we left the forest track to start another steep climb. That brought us to the finish of this hike: the Musenge rock-shelter. The shelter is nothing more than that, a roof attached to an overhanging rock. It is sometimes used by park staff. That shelter suddenly also served us well because it started raining. The rainforest really lived up to its name. We waited for an hour for the rain to stop, but when it didn’t we started the 9km march back to the hostel. We only had a quick stop again at the park entrance where we muddled the warden’s office with our wet gear. Neither from the trail nor from Kilembe did I see the Rwenzori’s famed snow-capped mountain peaks. Later I asked a guide in Fort Portal about it, and he said that there is a viewpoint along the main road between Kasese and Fort Portal from where on a clear day you can see them. Otherwise there's no other option than embark on a multi-day hike through the Rwenzoris. The nearest city is Kasese in Western Uganda. Kasese has good transport links with main cities such as Fort Portal, Mbarara and Kampala. From Kasese you can access one of the trailheads such as Kilembe or Nyakalengija within 30 - 60 minutes. The park boundaries are only reachable on foot. Glaciers: "In 1906 the Rwenzori had 43 named glaciers distributed over 6 mountains with a total area of 7.5 km?., about half the total glacier area in Africa. By 2005, less than half of these survive, on only 3 mountains, with an area of about 1.5 km?" Henry Morton Stanley: First European to see the range (1889) during his expedition to rescue Emin Pasha. Highest peak named after him. Foreigner prices: Park fees: 15,000 UGX for East African Community passport holders, 25 USD for foreign residents and 35 USD for other foreigners.